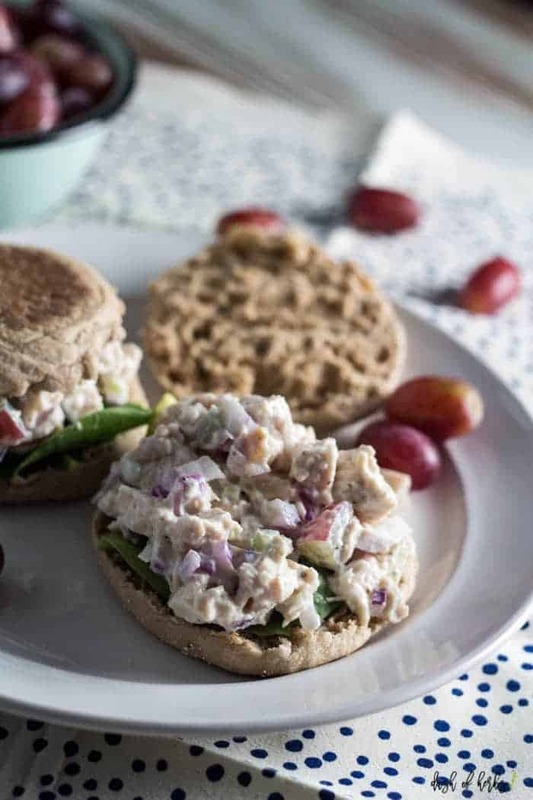 The summer months can finally be spent without turning on the stove with these easy chicken salad sandwiches recipe. 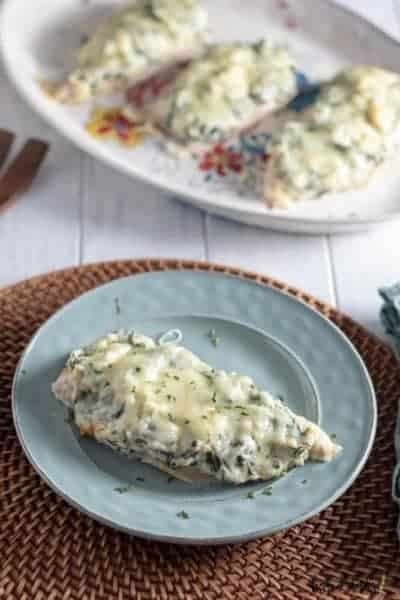 It’s a quick lunch recipe that you can throw together super fast for a week day lunch or dinner recipe. It’s only 3 Freestyle points per serving on Weight Watchers. Sometimes in the summers in the South, you just can’t turn on the stove (especially the oven). It makes the house too hot and it makes you feel so miserable. That’s part of why I love chicken salad. It’s served cold and tastes just like summer. 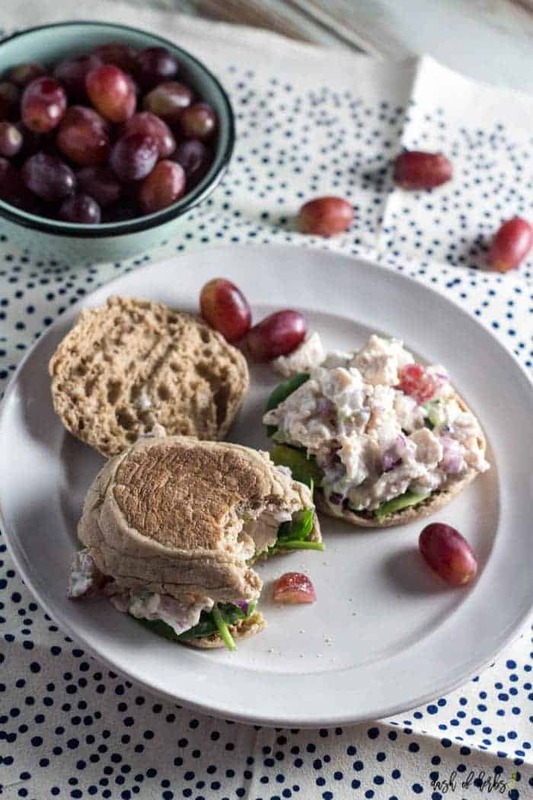 These chicken salad sandwiches are sweet with the grapes, yet tangy with the celery and red onion. It’s a great combination and so easy to throw together. For all those people who only think Chicken Salad is supposed to be made in the summer doesn’t know me. 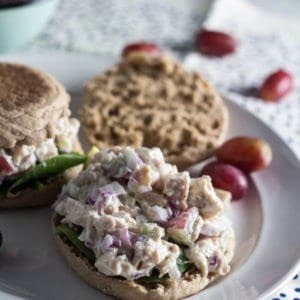 I love chicken salad (in a sandwich or by itself). I think that if I could eat this for every meal, I just might do that. But really…doesn’t this recipe look delicious? And it it. What makes this Weight Watcher friendly is using Greek yogurt instead of mayo. 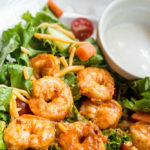 I am not a huge mayo fan anyways, but the Greek yogurt does a great job of making this a creamy and tasty lunch option. Chop up all the veggies and the chicken into smaller chunks. Then combine them with the yogurt, garlic powder, salt and pepper. After you have mixed everything together, toast your English muffin and serve. 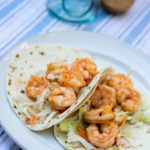 What are some of your favorite recipes on hot summer days? This recipe is 3 Freestyle points if you include the English Muffin. In a small bowl, combine the chicken, yogurt, grapes, celery and seasonings. Stir until fully combined. 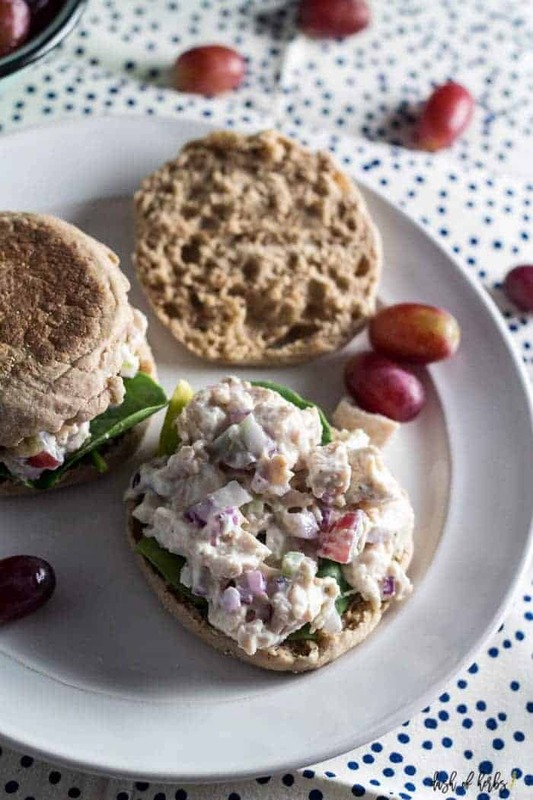 Toast the 4 English muffins and add the chicken salad to each one. Top with the baby spinach. Serve immediately. If you don't want to use pre-cooked chicken, this would be equivalent to 2lbs of chicken breasts. To change things up, you can add in different things, like apple chunks or more celery. 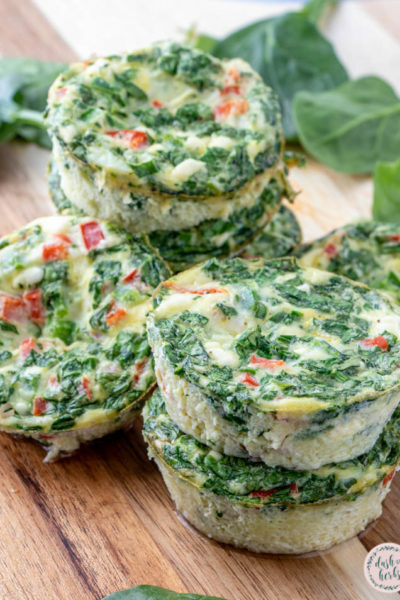 You also don't need to use the English muffins if you want a low-carb option. You can use non-fat, but I think I just used regular Greek yogurt. Is the Greek yogurt non-fat? I used the Tyson Grilled and Ready strips and then chopped them (or get the ones already chopped up). Either worked for us. These are in the refrigerated section of the store by the bacon…not the canned chicken variety. Kristyn, when you say 2 packages of pre-cooked chicken, is there a brand you tend to use? Do you mean the pouches like tuna comes in? I am looking forward to trying this recipe! I need to update the values for both of these things since there have been questions about them. Sorry about that! The yogurt container is a 6oz container (so the smallest individual you can find). The chicken would be equivalent to 2lbs of chicken breast. Hopefully that helps. I love the recipe, but was confused by amounts such as 2 packages pre-cooked chicken and a container of yogurt. 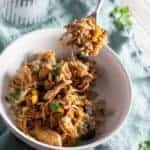 I did find in the comments the chicken amount is 1#, is the yogurt a 6 oz container? I do not buy prepackaged products and usually have a huge container of things like yogurt, so exact amounts are super helpful. Thank you, and I look forward to more ideas! I used a small container (I think they were single sizes at 5.3oz serving sizes). You can use more if you want, but be careful of the SmartPoints value. The recipe says a container of yogurt…how big a container? Sounds like a yummy recipe!! I found that it makes too much for just 4 english muffins. You could add 2 more, if you want, or just eat the leftovers plain (that’s what I did). It’s up to you. Hi! Using four English muffins, how is the recipe split into 6 servings? Thanks for clarifying! I would probably use 1lb of chicken and shred it. And then I would probably sort out about 1/2 a cup on each English muffin. 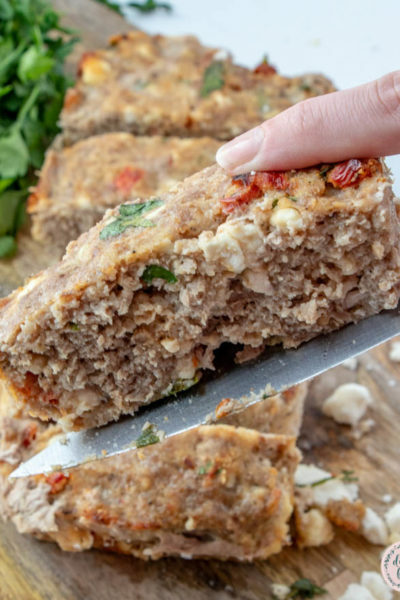 And I’m SO happy to hear that you love these recipes (this one is a fav in our house). I’m taking it easy this summer, but I’ll be back with my regular posting schedule in the fall. Kristyn, if you didn’t use the pre-packaged chicken, how much chicken would you use? I love your recipes by the way. I am a weight watchers foodie who doesn’t want diet food but great tasting food that is healthy! You have given our family some great options. Keep it up! Thank you! 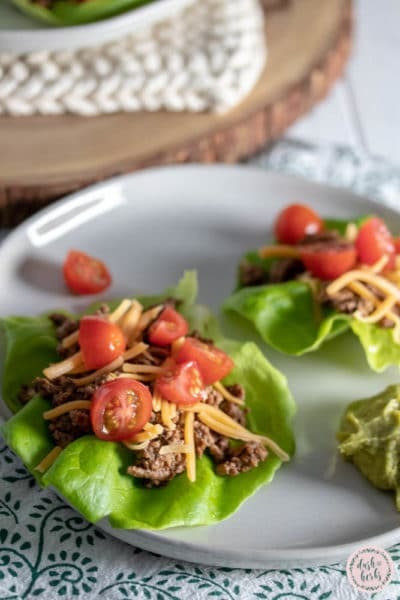 They are delicious and it’s so easy to throw together. I just had the leftovers tonight without the English muffins, and it was wonderful! I love the grapes the most! These look delicious!!! I’m totally getting the ingredients for them this weekend! Oh yes…I wouldn’t do a recipe that’s too fussy. That is totally not my style. If I don’t know what an ingredient is or can easily say it, I don’t want to use it to cook. Simple is the way to go. I cook most meals after work, so if I can’t put dinner on the table within 30-45 mins (unless it’s a crockpot recipe), I don’t want any part of it. So, you won’t find any of that here, I promise you! 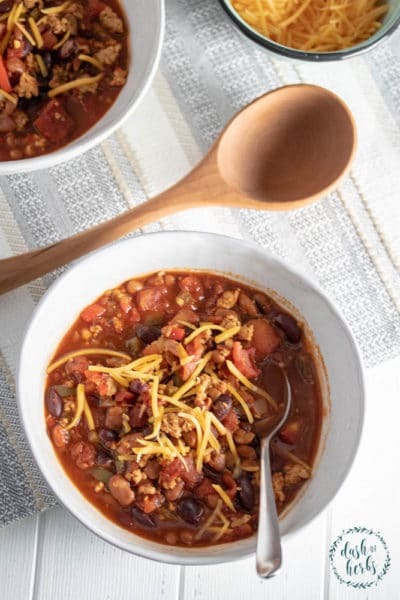 I’ve been browsing the recipes you posted, and I’m relieved most of them are simple! I tend to get intimidated by complicated ingredients because I’m no cook; I had to learn in order to survive! Hahaha! Thank you so much for saying that! 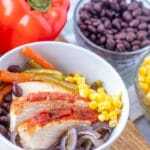 I really do hope that you find tons of recipes that you can cook – they are all fairly easy – to help you cook at home. I do love eating out, but I know I eat so much healthier when I cook. I made the Parmesan Chicken recipe again tonight! So I use these recipes too! Hi, Kristyn! 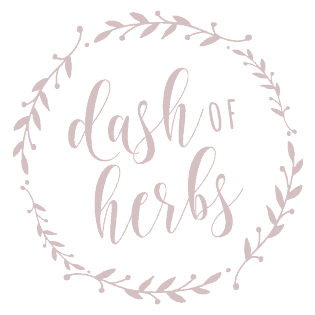 Just stopping by to congratulate you again on the successful launch of your new food blog! For someone who advocates (or at least try to) having home-cooked meals more than eating out, you’re heaven-sent! I’ll be saving plenty of your recipes for me to try soon!